I am sure this has probably been covered before, but what would be the downside of using a broad market growth index fund in lieu of a total market index fund. Using the Russell 1000 Growth ETF (IWF) adds almost .50% a year extra from 2008 until now. Plus the volatility would seem to be a benefit to the PP. Jeffreyalan wrote: I am sure this has probably been covered before, but what would be the downside of using a broad market growth index fund in lieu of a total market index fund. Using the Russell 1000 Growth ETF (IWF) adds almost .50% a year extra from 2008 until now. Plus the volatility would seem to be a benefit to the PP. Since 2007 Large Growth has done better than the market as a whole; from 2000 to 2006 it did horribly worse than the market as a whole. 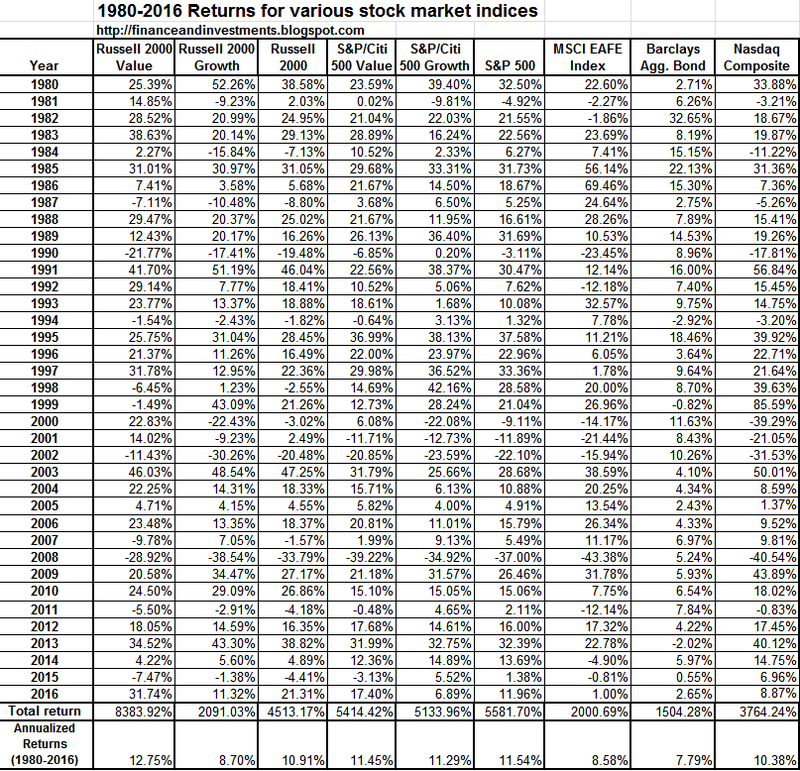 and see how it did vs the S&P 500 TR or Vanguard Total Market from 2000 to 2006. Or go to https://1.bp.blogspot.com/-v32Oa5eKR6k/ ... eturns.png and compere hoe the Large Growth (S&P/Citi 500 Large Growth TR) did vs S&P 500 during those years. Or look at Morningstar's "large growth" category vs the S&P 500 or total market index, or the Simba/Siamond spreadsheet for LCG vs LCB, or Tyler's website. Now, to be fair, Large Cap Growth did outperform from 1994 to 1999 just like it did recently...but it under-performed in the early 90s (after outperforming the index in the mid-late 80s and under-performing during the early 80s, after outperforming from 1979 to 1980, after under-performing from 1973-1978, after outperfoming in the early 70s...and so ad infinitum). Imagine an ancient warrior who has a sturdy, battle-proven shield: this shield has saved his life before, many times in fact. He knows it well, he knows its weight, its balance, its capabilities and limitations. He has an intuitive feel for it, almost like it is an extension of his body. He trusts it, and this provides the warrior with a tremendous sense of confidence when he charges into battle. One day however, a blacksmith is chatting with our ancient warrior and begins describing a new shield that he just had made: it is almost the exact same shield, but 25% of the shield's material has been slightly altered, theoretically to make the shield stronger. As far was our ancient warrior can tell, the blacksmith makes a logical case for why this mild change in the use of one of the metal alloys should, indeed very likely would improve the shield's performance. The warrior asks to test the shield in battle, and the blacksmith being curious as to how it will hold up in real world battle conditions, agrees to let the warrior use it for his next engagement. On the eve of the next battle to be fought, our warrior does some drills with the new, slightly improved shield. But it feels different as he grasps it. He doesn't "know" this shield like he did his old one. A sliver of doubt enters his mind, and his confidence wanes, ever so slightly, but enough so that it registers in his mind. The next morning, as the battle is about to begin, doubt suddenly turns to fear. "What if the blacksmith was wrong? What if I can't handle this shield as well? ", and so on the warrior's mind races with a thousand "what' if's". As the warrior charges into battle and crashes into the enemy, fear suddenly surges into panic. Even though the shield is materially very similar to his battle-tested shield, and logically should preform almost the same as the old one (and very possibly even a little bit better) the incredibly stressful conditions of battle have turned a mild doubt about the new shield's reliability into a total loss of confidence. After absorbing only a few blows, what remains of the soldier's confidence in his ability to hold ground against the enemy is shattered. He drops his shield and routs at precisely that critical moment of battle when his old, battle-tested shield had always provided him the iron discipline required to hold-fast -- usually right before the enemy themselves usually would capitulate. Upon returning to camp in utter shame and defeat, the soldier retrieves his old, battle-tested friend and swears never to go into battle without it again. The intangible confidence provided by the knowledge that his old shield had always protected him in the past turned out to be a far greater force multiplier than any incremental improvement that might have been squeezed out of changing the actual chemistry of the shield. Wish he'd include summaries. Im too busy doing nothing, no time for 3 page articles.